Many of the Nucleonica applications show a nuclide icon at the top left of the application indicating which nuclide has been selected. These nuclide icons have now been updated to be consistent with the nuclide box structure used in the Nuclide Explorer++ and the Karlsruhe Nuclide Chart. In future versions of the applications, the box structure will also depend on the database selected (i.e. currently JEFF3.1 or ENDF/B-VII.1). To date this feature has been implemented in the Gamma Library++ application. 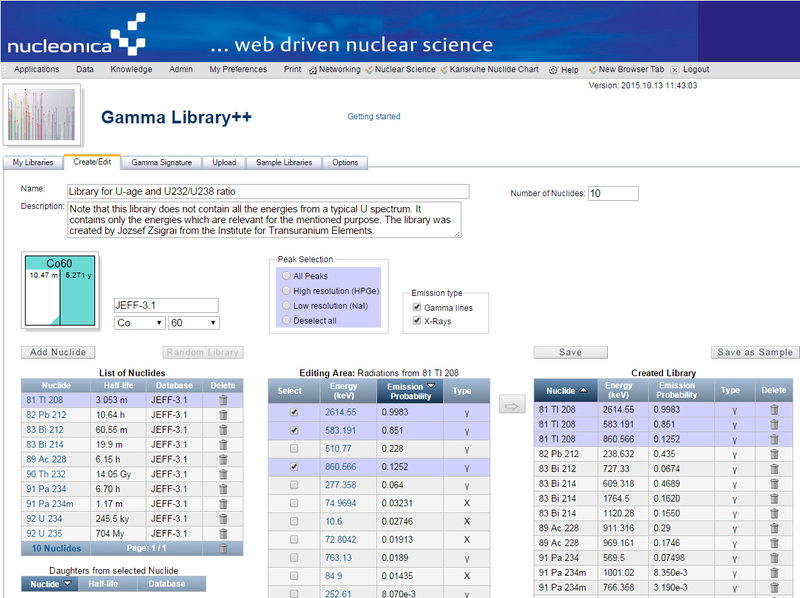 The Gamma Library application in Nucleonica has been extended to include ENDF/B-VII.1 data. For creating gamma libraries, the user now has a choice of databases to be used i.e. The most recent nuclear data available can be found in the ENDF/B-VII.1 database. In addition the nuclide box shown, (in the Create/Edit tab) when adding nuclides to a library, depends on the database selected (JEFF3.1 or ENDF/B-VII.1). The nuclide box structure is identical to that used in the Nuclide Explorer++.